Get in touch by phone or fill in a short form to have one of our customer representatives contact you. Download the current Miele Price Guide in PDF format. 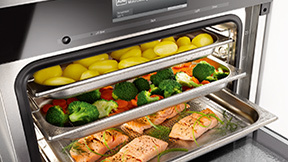 Search our recipe collection and be inspired to cook gourmet food in your Miele oven, steam oven, combination oven or cooktop. Peace of Mind. A Miele warranty ensures that should you experience a problem with an appliance you are covered. We are thoroughly committed to providing every Miele Customer with the highest level of satisfaction. We know our appliances best and we know that you want things done right the first time.